Sean O’Sullivan’s slim monograph on Mike Leigh, the latest volume in the University of Illinois Press’s series Contemporary Film Directors, is one of the better examinations of his output. Rather than rehashing Leigh’s notorious working method—the focus of seemingly all writing about Leigh—O’Sullivan aims to “trace connections and continuities in Leigh’s cinema,” an effort in which he succeeds. While occasionally referring to Leigh’s earliest film and television work, for the most part O’Sullivan focuses on ten of Leigh’s most recent movies (1983’s Meantime through 2010’s Another Year)—although he does spend time with the early curiosity The Five-Minute Films and the masterful short film The Short and Curlies. One of the main connectors between so many of the films are the mini-narratives on which Leigh lavishes so much time: Maurice’s photography subjects in Secrets and Lies, Vera’s clients inVera Drake, the various people Johnny meets during his night out in Naked, taxi driver Phil’s fares in All or Nothing. In many of these cases we learn a lot about the glimpsed characters, often more than we know about the focal characters of the film, and those mini-narratives link them to the main characters. The study as a whole articulately probes into the links between all of Leigh’s films, and the author is careful to construct his arguments so that it’s convincing that all of the ties reflect Leigh’s intentions, and not just the critic’s skilled rhetoric. 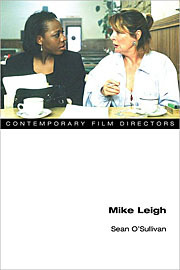 Even though the first chapter is titled “How to Watch a Mike Leigh Movie,” one of the author’s conclusions is that despite the filmmaker’s reputation, there’s really no such thing as a “Mike Leigh film”—or at least, once you start digging into the films, there is no real certainty regarding what that phrase might mean. After the study proper, the book ends with a detailed filmography and a short interview between the author and Leigh. This book is an essential work for fans (and detractors) of Mike Leigh’s cinema. This entry was posted in Uncategorized and tagged Spring 2012 on November 8, 2013 by admin.